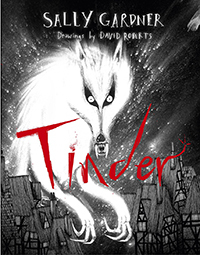 In his video recording on the Carnegie Shadowing website, David Roberts explains how he created the wolves on the cover of Tinder by drawing them first in black pastel, then reversing the image out into white. He says that, by flipping it into negative, the image suddenly glowed and had a vibrancy. It shimmered. text, but also reflects the nature of the story – a dark ‘reversed out’ fairy tale (of Hans Christian Andersen’s ‘The Tinder Box’) in which the negatives of war are revealed in a way that has particular meaning for a modern audience. Roberts’ method of drawing the wolves directly reflects this theme of dark and light, and highlights the interconnectedness of the two states. By using monochromatic imagery, with a single spot colour of red, the illustrator, like the author, requires us to view this tale in terms of complementary opposites. This is an example of a close synergy between the text and illustrations – a Greenaway criterion – and there are others. The use of scale, for instance. We first see the protagonist on p29 as a diminished figure relegated to the bottom third of an empty pale gray page, as befits a young soldier bewildered by the death and destruction that surrounds him; while the silver man, who wields awesome power, cannot be fully contained within the page on p187. Another highly effective example of this synergy is the use of white text on smudged black for the dream sequences. Most of the people don’t like poetry or they just don’t care about it. Maybe because they decided at one point that the ordeals of a lovesick nineteenth century bloke held no relevance whatsoever to their own lives. It is hard to tell. I love poetry. Even though I came from an educational background where in schools you can have only 2 types of interactions with poems; you either need to learn them by heart or learn what a third person (usually a literally scholar – who in most cases was already dead for decades) thought the poet wanted to say. There is little room for the student to form her own opinion or find a personal meaning hidden between the lines. Things are different if, by divine providence or sheer luck, one is given an inspiring and fearless literature like the one I had in the last years of high school or Mr. Gaydon in the novel. The engagement with poetry and the ways it can help us to get through difficult times is one of the things I really appreciate about Apple and Rain. I found this book through reading another book of Sarah Crossan’s, The weight of water, a novel which is told exclusively in free verse. Both of Crossan’s novels explore the narrative possibilities of poetry. Since it is a short and economic form, one has to concentrate on the really important parts. It also can help to deal with sensitive topics without being verbose or too sentimental. 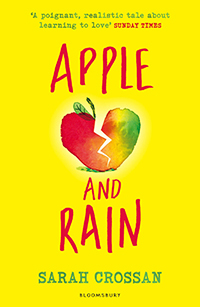 Apple and Rain shows us the process how Apple meets a poem, engages with it and finally writes her own version. It is also interesting how for the first half of the story she also writes a “fake” version of the assignment being too self-conscious to show her real writing. In this respect (engaging with poetry and creating new poems), the story is quite similar to Sharon Creech’s Love That Dog (2001) where writing poetry helps the protagonist to get over the death of a beloved pet. Rules of Summer is a treasure hunt. The clues: two simple framing sentences, 16 puzzling one-sentence rules starting with “never” or “always” and a set of surreal illustrations of two boys in various situations. From this, readers may run in frustration (some reviewers have) or they may construct a map of hidden meanings that is partly Tan’s and partly their own. Shaun Tan is known for creating complex picturebooks with evocative illustrations and few words (or, indeed, no words at all). Rules of Summer continues Tan’s visual language of mysterious landscapes, objects and beings, including the dinosaur shapes that stem from a childhood obsession with tracing dinosaur pictures, but is less cluttered than some of his other work. 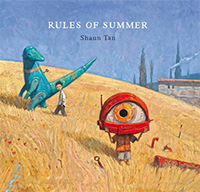 As Tan is incredibly articulate about picturebooks as an art form and his work in particular, we know that, to him, Rules of Summer is about a relationship between brothers, the arbitrariness of rules and the discrepancy between emotional experience and what can be described via language. We know that Tan considers it to be a sort of sequel to The Red Tree: while The Red Tree explores “the strangeness of an individual’s inner life”, Rules of Summer portrays “the strangeness of any close partnership – it cannot be adequately explained to the third party”. However, we also know that Tan is reluctant to prescribe meaning and, instead, encourages readers to interpret his work freely through “slow reading” and their own imagination. Thus, the author is alive (and eloquent) but there is no one correct way to dig (or read) for treasure. NCRCL MA student, Jonathan Brough, writes about his experience in researching and writing his essay/article ‘Prosper the Bonaventure… Storm Coming Now’ for Travels in Children’s Literature. The article will now be published in John Meade Falkner Society Journal (forthcoming July 2015). Appropriately enough for an essay to be submitted as the Travels in Children’s Literature assignment, it all began with a trip to New York City and a side-adventure to the bookstores of Union Square. Barnes and Noble was the source of a copy of the latest Horn Book and, having read an intriguing review (and succumbed to some very clever advertising) for a new teenage title by South African writer Michael Williams, I journeyed through the eighteen miles of books shelved in the nearby Strand Book Store and finally found a copy. Every so often in life, perhaps once every eight years or so, I’ve discovered a book that just stops my world, everything else pales into insignificance and venturing through the narrative of the novel is the only thing that matters. I’m transported into a world utterly alien to me, but one that I can also completely understand; I’ve never had any of the experiences depicted in the plot, but I can empathise with all the characters nonetheless. The list is short: The Remains of the Day, To Kill a Mockingbird, Waterland, The Fault in Our Stars perhaps, but my find that day has definitely become a member of the short but select group. I started reading it on a bench in Union Square, somehow — I genuinely don’t remember how — I got myself back on the subway to my hotel room and I finished it at about two o’clock the next morning. 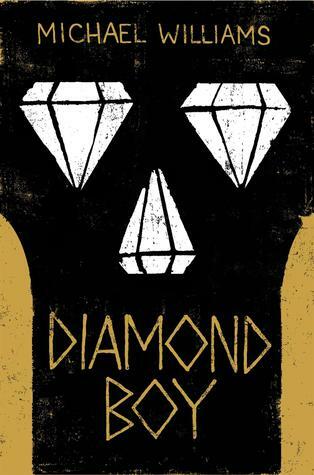 It was Diamond Boy (2014) by Michael Williams. For the second year running we have held a very successful Carnegie Reading Group, open to any member of the NCRCL community. MA and PhD students past and present, as well as NCRCL staff, have met in the LRC at weekly twilight sessions from April to June, and enjoyed in-depth discussion of the two shortlists, while remote access to the discussions has been available via Skype and Twitter. 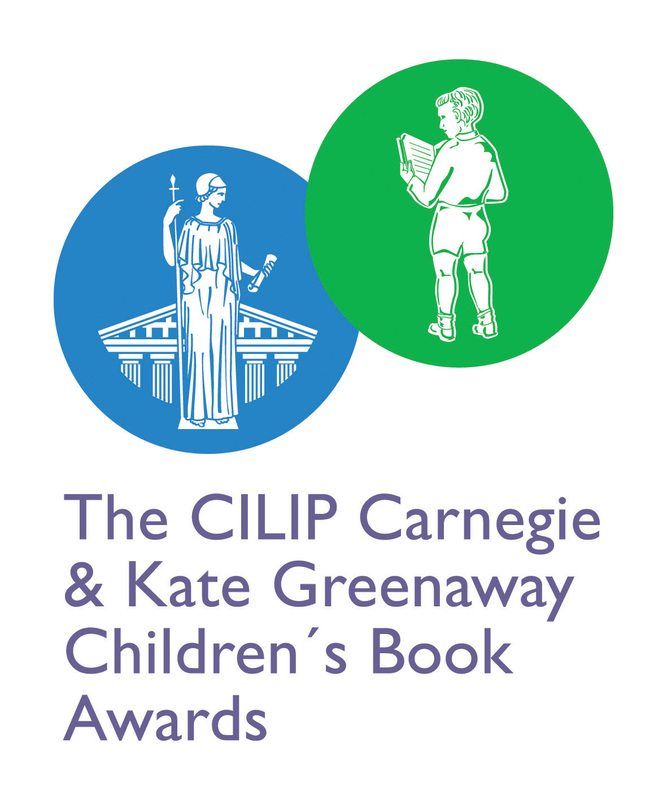 The Carnegie and Kate Greenaway Medals are the UK’s oldest and most prestigious children’s book awards. Initiated in 1936, and often described by authors and illustrators as ‘the one they want to win’, they are the gold standard in children’s literature. The Carnegie Medal is awarded for an outstanding book for children and young people, while the Kate Greenaway Medal is for an exceptional book in terms of illustration. Schools and public library reading groups started to ‘shadow’ the awards in the early 1990s as a way of encouraging children to discover the best modern writing for young people, and our adoption of this opportunity seems entirely appropriate for a department dedicated to high-quality research in the field of children’s literature. Not only can we widen our awareness of the latest high quality books published (titles already judged ‘outstanding’ by the Carnegie/Greenaway shortlist selectors), but it has also been hugely enjoyable reading and discussing these texts with like-minded (but very differently-opinionated!) peers. And while not having to write an essay is definitely a bonus, the group have produced some fascinating and authoritative reviews which will be appearing on the NCRCL blog over the summer. We hope you will enjoy reading these. Have a look at the Carnegie website for details of the shortlists – and this year’s winners! And now read the books – they’re worth it!! For a reminder of the Roehampton Readers review series from 2014, see the Roehampton Reader archive on this blog. PhD Day 2015 delegates listens to the speakers in Session 1: Anne Malewski and Kay Waddilove. A fascinating and eclectic set of papers, along with some innovatory events, combined to make the 2015 NCRCL PhD day an exceptionally interesting and enjoyable occasion. In Session 1 Anne Malewski offered a detailed deconstruction of the Shane Meadows’ film This is England (including a perceptive observation on the likeness between Margaret Thatcher and the puppet of Roland Rat), which led to vigorous debate and intense questioning from the audience. Kay Waddilove’s discussion of the 1950’s career novel phenomenon linked this short-lived but highly successful genre to the socio-economic changes of the post-war decade, particularly with regard to women’s lives, and postulated that such populist literature could carry important ideological messages. Sinead Moriarty speaks about Robert Scott, J.M. Barrie, and Antarctic adventure narratives. 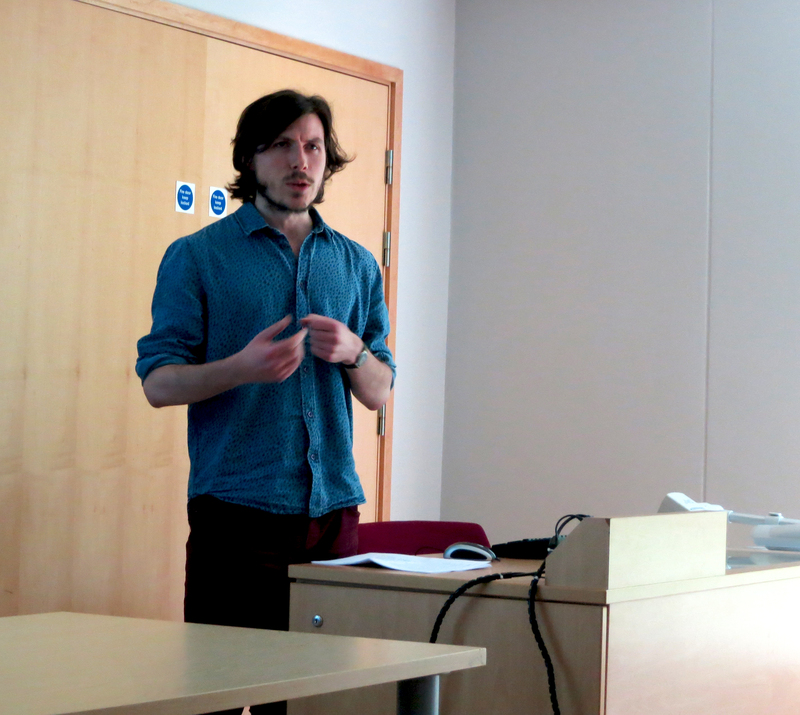 Nick Campbell presents on his research into Neo-Romaticism and the ‘archeological imagination’. Session 2 dealt with landscape matters: Sinead Moriarty used compelling images to discuss the dialogue between children’s literature and heroic-era stories, analysing the impact of J.M. Barrie’s Peter Pan on Robert Scott’s Terra Nova narrative, and establishing persuasive links between the Antarctic and Neverland. Nick Campbell spoke of William Mayne’s subtle use of language and his ‘archeological imagination’, using a range of paintings and illustrations to demonstrate his thesis on the representation of Neo-Romanticism in prose as well as in the more acknowledged visual medium. Sarah Pyke reports on her research into LGBTQ adults’ reading practices, a project that is a part of Memories of Fiction: An Oral History of Readers’ Life Stories. After a delicious (and ecologically sound) lunch at The Hive, we returned to another pair of papers in Session 3. Sarah Pyke outlined the progress of her empirical research pilot with LGBTQ adults recalling their childhood reading, illustrated by original quotes. She went on to discuss different types of reading and how reader-response theory can address the effects of the childhood reading choices of LGBTQ adults. Erica Gillingham focused on Romance studies and discussed how lesbian YA novels combine aspects of popular romance, lesbian romance, and YA conventions, proposing an original analytic model of seven narrative elements for the genre, from the introduction of the heroine to the all-important first kiss to the resolution. The fourth session concluded the day with talks from two fortunate beings who have recently completed their PhDs. Simon Machin outlined useful practical tips for revising and submitting the final thesis, while Judy Bainbridge (Dr Bainbridge!) reflected on the final stages between submission and viva. Bake-Off entries made by delegates. Lunch at Growhampton’s The Hive. Delegates awaiting the winner of the PhD Day 2015 Bake-Off! Kay Waddilove and Erica Gillingham chatting before the Exhibition posters. All left with full minds & happy bellies! Altogether a memorable day, and many thanks are due to all involved. The day was enhanced by the Exhibition and the fascinating poster displays compiled by delegates. These featured several ‘bookshelves’ – ecological titles by Peter Dickinson, archival copies of Puffin Post from the 1970s, first-edition career novels of the 1950s, lesbian YA romances, as well as a Memory Wall bookshelf created by attendees, and a post-it display on being-an-adult v being-a-child. The crowning event, however, was undoubtedly the Bake-Off, featuring a splendid array of home-made goodies, all linked to children’s literature, contributed by the delegates. Thanks are due to Alison Waller who bravely agreed to judge the winner, and (channeling Mary Berry to perfection), nobly tasted every contribution – and still so slim! Offering the opportunity for speakers to be videoed added a useful learning dimension for the presenters, and for this, and the other innovations, and not least their excellent advance organization of the day, huge thanks are due to Sinead and Anne. Thanks also to the contributors for providing thought-provoking papers which illuminated the variety of research projects being undertaken in the NCRCL. And finally, a nod to the outstanding and committed staff of NCRCL who force – ooops, I mean encourage – their research students to participate in such invaluable events – sine quibus non! !